Books are a great source of information, and there is something about holding one that I thought I would not have been able to replace with anything else. However, I’m also a lover of tech, so it only seemed natural to me to see how two great medical textbooks shaped up on the iPhone. I have spent the last month trialing how these apps played out in a medical education environment and I admit I was surprised. So what are these two great medical books you ask? Well as they put it, one is as ubiquitous in hospitals as stethoscopes and is known as The Oxford Handbook of Clinical Medicine. The other is a handy, albeit hefty manual, that delivers on-the-spot answers to patient management questions and is the well-known Harrison´s Manual of Medicine. The content of both this books is superb and many a medical student through to residents, use them to stay informed. As the content is so great, I will waste no time on harping on about what a great read it is, but how this content goes when displayed on the front screen of an iPhone 4. 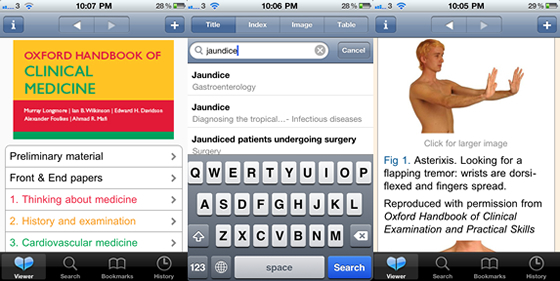 The current Oxford Handbook of Clinical Medicine iPhone app ($AUD 74.99, £34.99) has a arisen from a collaboration between Medhand and Oxford publishing, and on the most part they have managed to create a good product. Virtually everything is included, from Chapter 1: Thinking about Medicine through to Chapter 20: Emergencies. There are essentially four basic ways to access the information: through the viewer mode, search mode, bookmarks (where you save your favourite pages) or history (your recently viewed pages). Ultimately you will probably end up spending most of your time accessing pages through the search mode. Pages can be viewed in landscape mode, but you will lose the navigation bar at the bottom. You can still navigate by clicking links at the top of the page, which allow you to move back and forth between sections. The bookmarks feature (represented by a + on each page) allows you to save your favourites for easy access later. A great feature is that the there are links within pages to other similar or relevant pages, which allow you to easily breeze through different chapters that mention a certain topic (e.g. Pneumonia is in the Chest Medicine and Emergencies chapters). Tip: Change the default style from normal to iPhone in: Settings | OHCM8 | style. In my opinion this style is more aesthetically pleasing. In this latest edition, the apps allows you to pinch zoom which can help those who struggle to read the default text-size. Any images or tables within a page are presented as thumbnails, and are click-able, so that you can view them separately at full size. Tables are typically best viewed in landscape mode. Read something interesting and want to take a look at the reference for it? Well the app provides details and hyperlinks to all online references, so you take a closer look at the original paper. Think you need to carry round Talley & O’Connor on ward rounds? Forget it. The 8th Edition of the OHCM now has a section on history and examination. Perfect for the quick reference that you need on the wards. The most noticeable benefit of this app over the book in my opinion was demonstrated firstly on one and than again on several more ward rounds. Like most ward-rounds, the consultant or the leader tends to question his colleagues and students. In one scenario, my clinical group was asked a question which none of us could answer. So my consultant said, ‘Can someone whip out (Australian slang basically for get) their Oxford Handbook and tell me the answer’. So like most medical students most of the group went for the book to at least show we were interested in finding out the answer. I on the other-hand pulled my iPhone out of my pocket (admittedly to some quizzically looks from consultant), loaded the OCHM8 app, went to search and got my answer. All of this while the rest of the group was still searching through the index of the handbook. My point from this story is that, while I like many others love a solid book in my hand, apps that are designed well can now give us the information we need much faster. More importantly your smart-phone can now become a small and lightweight mobile library. Not all elements are retina display worthy. Images are reasonable crisp and clear, but higher resolution images would allow users to actually zoom in without the images going grainy. Overall, the app designed by Medhand is pretty well thoughtout and places the great content of the Oxford Handbook of Clinical Medicine right in your pocket. In my opinion, it is a must have for any iPhone weilding medical student. More to come later on Medhand’s Harrison´s Manual of Medicine iPhone app.